I posted a recipe for cucidati a few years ago but I recently tried a different dough recipe given to me by my cousin Barbara. I added cinnamon and orange zest to the tender and flaky dough. It is wonderful. The cookies freeze beautifully. You can frost them and top with sprinkles or dust with confectioners sugar if desired. I left them plain for the photo so you could see how they should look when freshly baked. Enjoy them for Easter or other holidays. For the Dough: In a large bowl combine flour, sugar, baking powder, cinnamon, orange zest, and salt. Mix well. Add butter and shortening and cut into coarse crumbs. In a separate bowl combine milk, egg, and vanilla. Mix with a fork to combine. Slowly mix the milk mixture into the dry ingredients to form a soft dough. Knead for just a minute to bring dough together into a smooth ball. Wrap dough in plastic wrap and chill 2 hours. For the Filling: Combine all ingredients in a food processor bowl and pulse until you get a thick, smooth paste. Chill until ready to use. Assembly: Cut dough into four pieces. Take 1 piece and roll into a 10-12 inch long rectangle on a lightly-floured surface. Spoon a ½-inch wide strip of filling down the long edge of the dough and roll the dough up over the filling once to form an enclosed log. 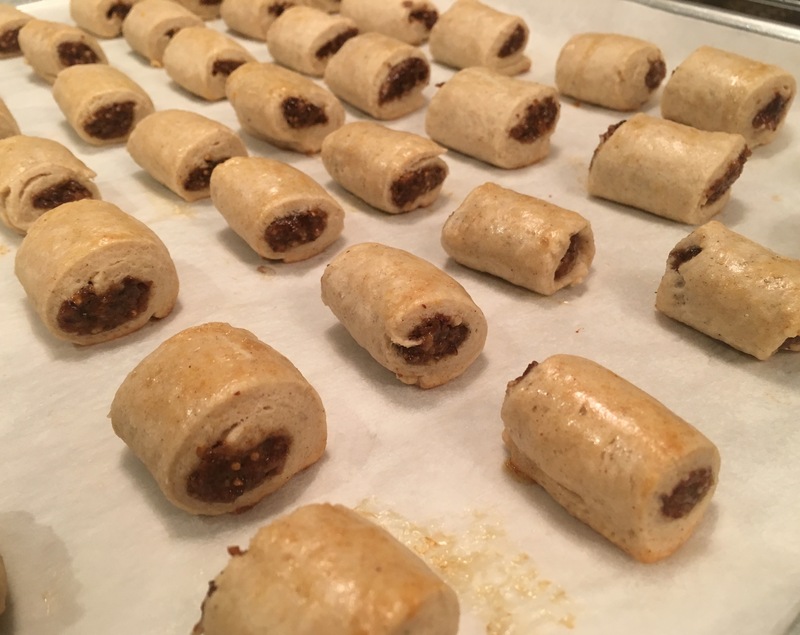 Cut the filled log away from the rectangular rolled dough, then take that long strip of fig-filled dough and cut into individual 1-inch long cookies. Place cookies seam side down on a parchment-lined baking sheet. Repeat by adding a strip of filling along the edge of the remaining rolled-out dough and roll it over the filling. Do this with the remaining three sections of dough. Brush each cookie with the egg white. Bake at 350 degrees for 15 minutes until the cookies are set, flaky, and slightly golden. Remove to a rack to chill completely. Makes 75 cookies. This entry was posted in Christmas, Cookies, Desserts, Easter. Bookmark the permalink.